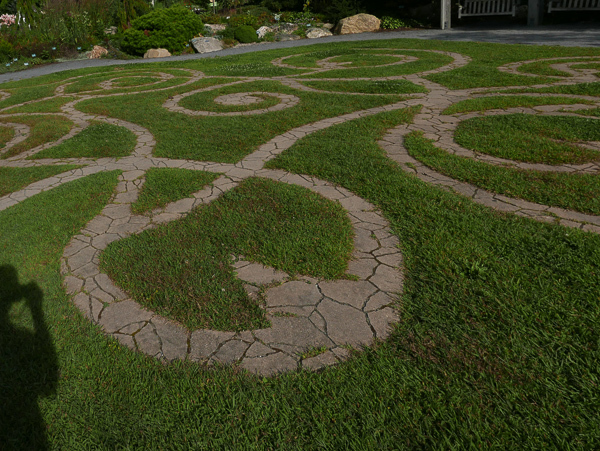 In just ten short years, Coastal Maine Botanical Gardens has become one of the largest public gardens in the country, ranking among the top ten percent. Our original master plan began in 1998 and was finished in 2004. Phase one of this plan was completed in 2011. The first phase included our original buildings, infrastructure, gardens, parking and restrooms, constructed based on a predicted attendance of 40,000 annual visitors. Remarkably, we surpassed 40,000 our second year of operation and in 2017, our attendance surpassed 190,000. We have welcomed visitors from 63 countries and all 50 states. The (non-profit) CMBG is now in phases two and three of its master plan; this transition — phase transition might be a little too strong — gives rise to the “unease” in my title. I wouldn’t go nearly so far as to say “crapification” — the gardens are still extraordinarily beautiful — but frankly, I came away from this year’s visit feeling somewhat curmudgeonly. This post will divide gradually into two parts: Photos in the first part will show the beauties of the garden; photos in the second part will shade into my sense of unease. (I hadn’t used the camera I was carrying for some time, so I had fewer shots to choose from than I would have liked; and I failed to capture any pollinators!) I’ll finally express my unease in prose; it had not occurred to me until the very end of the day to do anything by take pictures of plants! As with the museums for Maine two-footers that we posted on yesterday, volunteers (“like-minded dreamers”) sparked the project. It would be nice if more things could work that way. 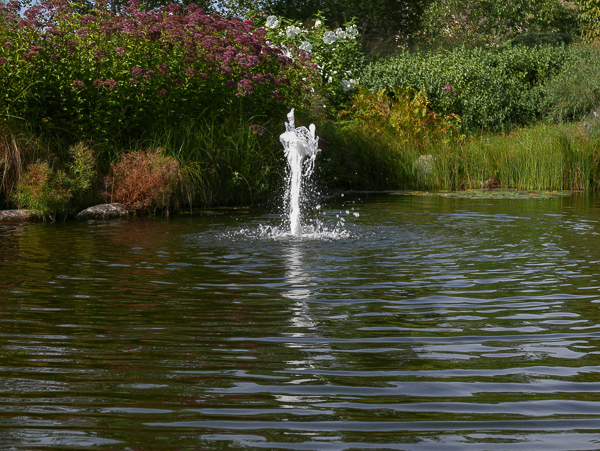 The sort of vista at which the CMBG excels; the circular regularity of the ripples from the fountain contrasts nicely with the rounded irregularity of the hills and plantings in the background. Foolishly, I made no notes of the plant species; perhaps readers can help. And although I deprecate bokeh, I can do it! The CMBG also excels at color combinations in the beds. I’m not sure the sun threw that beam exactly where I would have wanted to to be, but the colors of the flower are painterly. 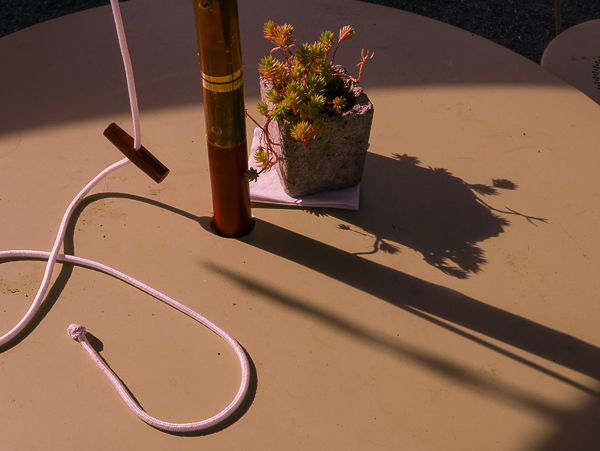 I had a lot of fun with the spiky cacti and curved umbrella cordage on the tables in a little outdoor café. 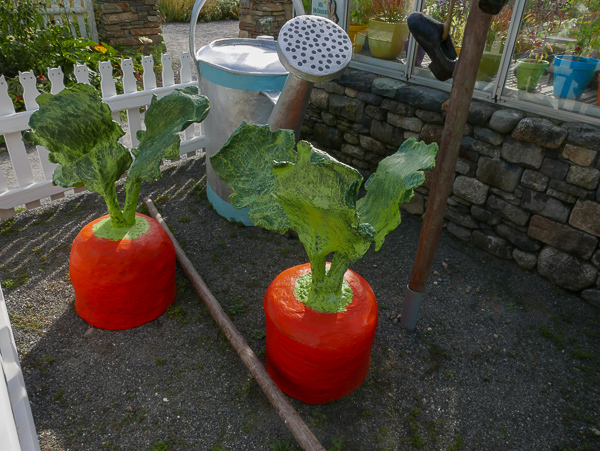 Monstrous artificial vegetables with garden tools, apparently meant to appeal to children (the area sponsored, to my unease, by Burpee). 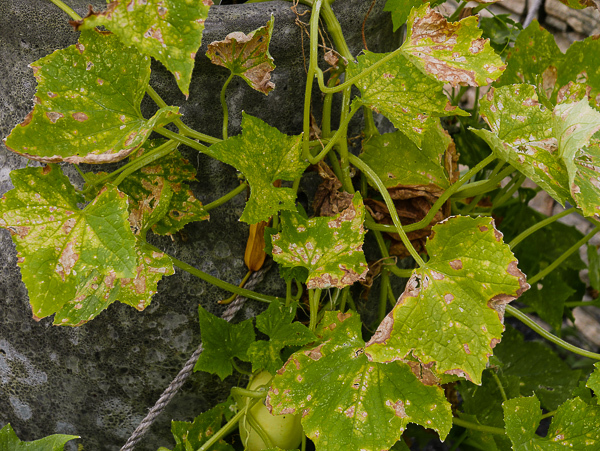 Squash leaves at the end of the season. Impermeable surfaces are frowned upon especially by permaculturalists because water simply flows over them on its way downhill, instead of soaking into the soil and helping out the plants. (This particular impermeable surface, asphalt, might be frowned upon because it’s made from fossil fuels.) While it’s hardly fair to make a desolate heat island like an empty parking a lot a symbol of CMBG’s second phase of development, that last photo does capture my unease. In past years, we parked in the woods and walked up a lovely, curved pathway to the Vistor’s Center, surrounded by tall plantings on either side. This year, we parked in the lot that you see (faraway trees), and walked up a paved road to more impermeable surfaces: An enormous paved walkway, clearly meant to service tour buses, and not surrounded by plants, but with home-and-garden style low beds with far too few plants and far too much bark mulch; my local bank has better plantings, although, to be fair, my bank has very good plantings for a bank. (One’s first site of the new Visitor’s Center is an enormous pavilion of bathrooms. I have nothing against bathrooms, but that a pavilion of them should be my first sight of the Garden seems a little bit much, although I understand the sense of relief that a tourist alighting from a long tour bus-ride would feel.) Having purchased our tickets, we then walked out over a long, unshaded wooden bridge, and then along an under-construction road, until we finally entered the garden proper; the temperature must have instantly dropped ten degrees when we were surrounded by plants and were finally able to experience what we came for. Touring the garden, we noted that some plants had not been well-watered — to be fair, it’s the end of the season — and unkempt lawns. More unease. Once again, we came at the end of the season and part of the grounds was under construction. And the garden was truly as lovely as ever — once we got into it. However, the unkempt lawn and unwatered plants made me speculate that the CMBG staff was stretched too thin; or that perhaps new hires were not fully conversant with the institution’s culture and methods. More concerning was my speculation that with growth as a goal in itself — even with, as “The People’s Garden” the very best of motives — the CMBG had entered the maze of corporate gigantism; as, for example, the children’s garden sponsored by out-of-state Burpee. I know the state of Maine, especially the coast, lives and dies by the tourist trade, so it would be churlish of me to complain about that; but I worry (because I’m a worrier) that if indeed it is optimizing for tourists, rather than for artistry in plant and landscape form, the CMBG’s new phase will begin to lose the very qualities that made it a destination in the first place (a botanical garden). One does not, after all, put a billboard on the side of Notre Dame, or a Starbucks in one of the chapels, and Paris does fine, just fine, with its tourists. In any case, I hope that a year from now, the plantings at the new Visitor’s Center will have greatly improved, the walk across the bridge to the gardens will be pleasant rather than galling, and some consideration will be given to minimizing impermeable surfaces, rather than maximizing them. Sadly, not a Maine co-operative like Johnny’s Selected Seeds or MOFGA. Nice photos. Shame about the asphalt. I’ll take this opportunity to mention that there’s a Permaculture Convergence (and barter fair) going on in my (literal) back yard next weekend, the 21st to the 23rd, in Hot Springs, Montana. Those in the area are invited to attend. It’s gonna be fun (and informative). Sorry. An old swing tune. Re asphalt, with growth, there will come a number of visits where lovely parking spots in the woods simply can’t sustain themselves. This is the one time I agree with the “too many people” theorists. With parking, and with hiking trails, and paths through the park, they can hold their own under a light load; heavier load and light maintenance and some rules have to be provided. Under a huge load, only industrial methods are going to produce. The smarter people were, the better they could judge what those levels of transition were. I guess this is also where I sympathize with people who use the word “groaf”. “Paving” materials are available that allow water infiltration. They can be both for parking areas and paths and heavy use trails and require little or no maintenance. Most are also attractive. The bush in the top picture is Beautyberry, I think – assuming it’s a bush. And the tall plants behind and to our left of the fountain are Joe Pye weed, a fall bloomer that likes water. I could look up the botanical names, but so could everybody. And while I’m at it: at high traffic levels, paving is necessary to protect the roots, especially of trees, and prevent mud. I’ll second GF’s point that permeable paving materials are available and better; I’ve laid a lot of them, and there’s a new permeable concrete. Unfortunately, they’re more expensive, and Lambert saw signs that the budget is under stress. Rapid growth is a difficult transition. But it would have been useful to offer a model, perhaps at the price of less parking. 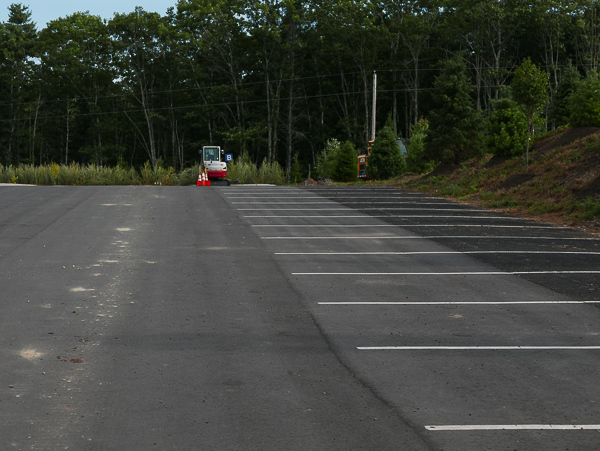 They may have set the parking lot well away from the garden precisely because it’s ugly. Plantings around the bathrooms would have been appropriate, but their placement is functional. And a third thought: is Yves getting around better? It sounds like it, from these outings. She obviously takes good care of herself, and that should have some payoff. i think the 1st photo is lilly of the valley (not sure though leaves are right and that stuff GROWS). if so, avoid!!! 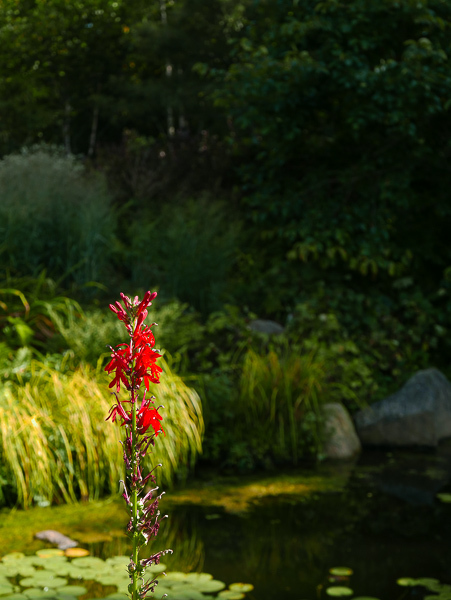 Second is cardinal flower with Joe pyeweed (left) and hardy hibiscus (background right) with possibly daylillies past flowering on the pond edge. Beautiful combo. 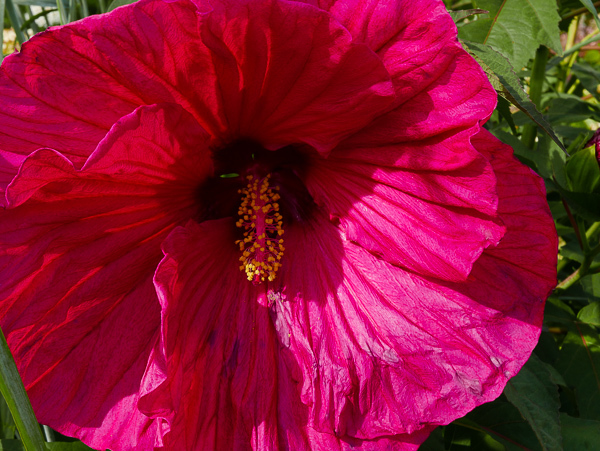 big red flower is hibiscus too. Coleus (fourth pic) is right too, the purple flower in 4th pic looks like a type of lobelia (not sure). Would love to know what the pink one is. Was it in Sun, wet or dry area? Don’t know what the summer was like in Maine, but here in Vermont we had a good start to the year but early summer was really dry and it killed off a lot of blooms and lawns. Result, No decent fruit, poor quality lawn and flowers very disappointing. Our spring and summer followed a similar pattern here in south east Michigan. But since I had dug the winter snow up off of my little yard and packed it onto my little garden beds for melting and soaking down into them in spring, my non-woody perennial ornamentals kept doing well long enough for me to give then two deep-soak waterings and keep them growing. In the August-September transition, they flower nicely and attract many pollinators. And fennel did well with no supplemental watering at all. And its flowers attract pollinators. Related to the cardinal flower is Lobelia siphilitica. It’s blue! I speculate that the first plant (spike of red blossoms) below the fountain is a salvia, but cannot identify the species. The 2nd plants (the variegated leafy plants) looks a lot like my coleus; can’t specify the variety, though. Thanks for this. Agree about the asphalt. But just knowing about this garden, and this organization, was a heavenly way to start off my week. I hope this garden (‘paradise’) inspires many to create more of them, and here’s hoping the pollinators have lots of good nesting spots in that habitat. Here in Tucson, the local Nature Conservancy office uses permeable parking lot paving materials. It’s on Fort Lowell Road between Mountain and Campbell Avenues. 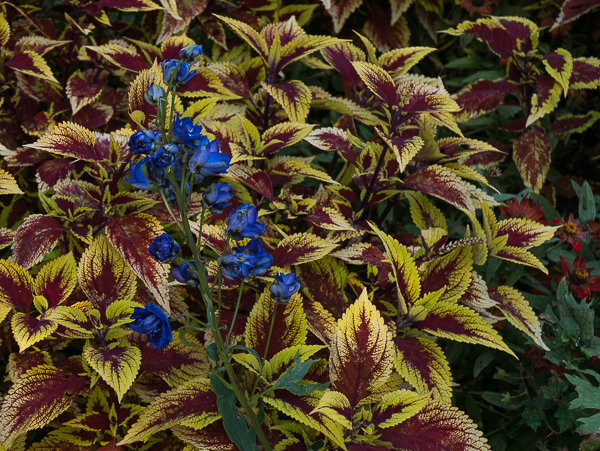 More flowers: I think the bright blue is delphinium (perennial), against coleus (tender, hence annual). 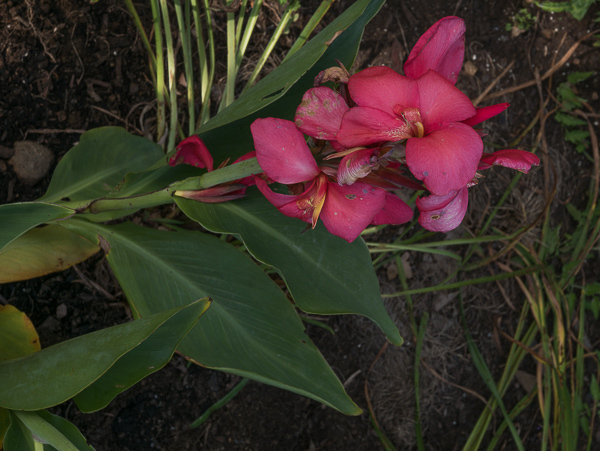 The pink flower looks like a canna, and the huge one is dinner-plate hibiscus. The flowers are at least 6 inches across, maybe more. I’ve tried to grow those, but the deer think those huge buds are candy. My mother has a big one by her front door at the assisted-living facility. Very effective marker. And I think that’s a sedum in the little pot, heaven knows which one. I have it in pots, too, as the local ones won’t grow in our clay soil, and I’m not about to take on a rock garden. That’s a great photo of the table top. Red flower is Cardinal Lobelia. A beautiful native plant, grows in moist places and is pollinated by humming birds. It is too bad about the impermeable parking surface but I am sure the climate makes for difficult choices. Snow and mud make things tough. The BG here in PHX has acres of asphalt parking but again climate probably rules as there are dust control/air quality rules that I am sure would cause trouble for such a large and popular attraction. My favorite BG is in Mendocino/Ft. Bragg. I seem to recall they had some kind of pebbly parking surface (you are advised to wear shoes that won’t sink into the ground, i.e., spiky heels). But the climate is very mild. Not that much rain to run off in AZ. That’s a pretty good botanical garden. One should mention that all new parking lots–at least where I live–are required to have retention ponds for the runoff. This keeps car drippings and other toxins out of the streams. Rain here tends to come in huge quantities in short amounts of time, hence flash floods. This year, we lost a 40 ft eucalyptus (barely missed the house). The ground was just completely soaked. Neighbors have had palms snap and large trees down or losing huge limbs. Last year our neighbor’s yard flooded pushing the fence over and flooding our pool and half our house (AZ tsunami). I think 2 years before there was 5 inches of rain at the school weather station – that was quite a day. These kinds of things happen in an hour or two of rain. Obviously nothing like Hurricane Flo but destructive nonetheless. The air quality rules here are helpful, but they probably make it hard to have non-asphalt lots. The dust is terrible for air quality. BG here is good, it is so large that we can have really cool events and art installations. I have to tell you, the walk from the HUUGE parking lot to the new sterile visitor center, and then through that and though another long walk that was as sterile as a moonscape (with only a pretty small hothouse with butterflies and their pet plants in it to break up the walk) was horrible. Absolutely horrible. Lambert is greatly understating how bad it was. And this also makes it impossible for anyone who is not in superb condition to visit. In the past, we could take my mother, who needs a wheelchair, to the curb of the old visitor’s building, get a wheelchair, and it was only a 2 minute walk to get her into the gardens. Someone in a walker also could have made a go of it before and done at least the main gardens. It is now totally inhospitable to mobility impaired people. I now have some chronic orthopedic conditions and the excessively long walk in and out set me back. And who wants to waste their time that way? I visited the gardens at the end of the season as well and concur with what you and Lambert have reported. As NotReallyHere noted above, it’s been a rough summer in Northern NE – long dry spell at the beginning followed by oppressive heat. We’ve got lawn grubs, too, so I don’t think I picked up on the state of the lawn – compared to most of the ones around here it looked quite lush. Hadn’t thought that the gardens might be suffering from a bit of neglect until you pointed it out. Maybe I just hadn’t noticed them in the past, but it seemed like there were a few more sculptures, and that they detracted from, rather than complemented the landscape. I hope that over time the sterile moonscape will fill in and become more inviting, but that won’t solve the barriers the new setup creates for people with impaired mobility. I love the garden which is a wonderful thing to treasure. About putting a Starbucks in the chapel – that may be on its way. You may have fortunately missed it on your trip to the Portland area, but recently one of those megachurches went in to a spot vacated by a big box store in a strip mall. I noticed recently it had a sandwich/wrap franchise incorporated into its ‘storefront’. I’m sure that’s exactly the way capitalist Jesus would have wanted it. Loaves and fishes will be provided – but it’ll cost ya! Lambert — I find it curious that you were disturbed by the unkempt lawn and lack of late season watering. While I take your point about how this gives evidence for some issues in the maintenance and perhaps funding for the botanical gardens I wonder that you didn’t fault the very existence of a lawn unkempt or not and fault the lack of watering for evidence the plants that needed watering may no longer be well-suited to the current transition of Maine weather. The giant fake carrots disturb me. 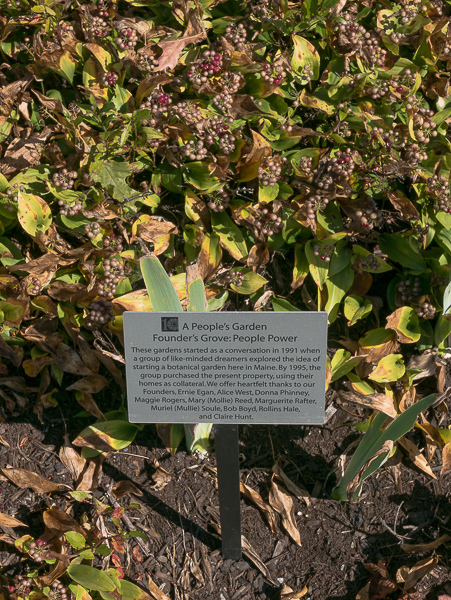 But instead of wondering why Burpee Seed Company instead of a Maine co-operative sponsored the exhibit I am more troubled that the local, state, and federal government doesn’t or can’t provide greater sponsorship for little amenities like botanical gardens. The contributions of private companies should be both unnecessary and should not be allowed. How many kids will insist that their parents pick up Burpee seeds [or would insist on Johnny’s Selected Seeds or MOFGA seeds] to grow carrots and then lose interest in gardening when they see what kind of carrots will grow in their gardens at home. Over looking the cracks in its path the maze is attractive — but wouldn’t be better suited to a location somewhere in gardens at the Chateau Versailles? Lambert and I have been visiting these gardens for the last 3 years running and I visited them before that. This lawn was never never never unkept. It was in the past the first thing you saw when you entered the main gardens and was clearly a point of pride. The maze is in the children’s section as an amusement. Thanks! The fuller context for Lambert’s description of the lawns helps me better understand. No matter how I feel about lawns I grow troubled when I see the lawn of a previously fastidious neighbor left to its own suggesting loss of a job or a divorce or a death. This is an article on some of the problems they’ve had with what some see as excessive growth. It is unfortunate that even nonprofits with best intentions feel compelled to overdo it. It does seem there are real issues with the scale of the gardens at that location and the objections are not just NIMBY related. Glad to see both you and Yves having some fun. Joe Pie weed, and ?. White flowers?. 1. Garden sculpture is common and frequently tacky, I don’t see anything objectionable here. I’d expect to see multiple sculptures at a public park or garden, not all of which are great. Also, what’s up with the shoes on a pole, and are those cats on the fence posts? So garden sculpture/art in general isn’t a problem, I think. 2. I don’t think sponsored by burpee is so bad. Sure, it would be better to be sponsored by a local organization, or not sponsored at all but only credited to the artist, but maybe those weren’t options. I guess the gardens know. …’guess its okay to visit nature…. …as long as you don’t track it into your $SUV$ after…. I hate walking on gravel or other uneven surfaces. I hate even more trying to drive my car over rough surfaces such as gravel. I am always afraid it will cut up my tires. In a poor economy, tourism is considered a real boon to the economy. It is impossible to keep mega corporate interests out of a growth industry or profit center. Here’s a photo of some big tacky carrot sculptures near where I live. Found you on Twitter. Noticed quite a bit of what you said in the “unease” section wasn’t quite right or the full picture – it might be worth checking out the Gardens’ website or Facebook page to get some more information. The children’s garden is actually the Harold and Bibby Alfond Children’s Garden (Maine organization), and is not sponsored by Burpee. The carrots are part of a sculpture display based on Peter Rabbit (those are his shoes dangling, his blue coat is just out of frame) as there are many parts of the children’s garden inspired by children’s books (Sal’s bear, for instance, is in a different section). There is more parking now, yes, but they have used permeable paving and a natural filtration system underneath, as well as native plantings around the lots — this information is also on their website. I would imagine that the reason that the lawn looks a little unkempt is because of all the trees they have been planting around the parking lots. I have been back several times this year, and every time I go the plantings around the lots have been further along, and they’ve been adding underplantings as they go. You can also read about what is going to be in the space right after the bridge – they are talking about a Maine-styled conservatory there, which would be very cool. I think it’s just barren now because they are doing it all in stages.